Here are some basic tips to help get you started. Grilling is a high-temperature cooking process that involves direct heat transfer. Steaks are adorned with the charred, slightly caramelized flavor given by flames, also known as the Maillard reaction. This basic approach to cooking meat is simple, as long as you know the important tricks. Preheat the grill to a high temperature. ~425F+ for ½ -1” cuts, ~375-400F for 1¼” cuts, as thin steaks require higher heat and thick steaks require slightly lower heat, respectively. When grilling a thick cut, it is helpful to preheat the grill to two temperature zones. One side for Charring/Searing the meat over direct high heat and the other for more gentle cooking. Burn and scrub any previous cooking residue off the grate. Using tongs, hold an oiled cloth to quickly coat the grill-grate. When flipping, the grill-marked meat will less likely stick to the metal. Be mindful: Opening a gas grill reduces heat. Closing a charcoal grill reduces heat (flame is choked). It is best to thaw the meat slowly (preferably overnight in a fridge). Approximately an hour before cooking the steak, bring the refrigerated cut out to room temperature – this will ensure even heat distribution. If using only salt and no rub/spice mix, be sure to liberally season right before cooking. This approach will prevent the salt from drawing out a lot of moisture from the meat). Place the meat on the hot grill and sear. Never change the cooking temperature during this stage. Once the meat begins to release moisture from the top, it is almost ready for the first flip. Be prepared to flip the cuts using tongs. This will not pierce the cut and release juices. Flip once at this ‘halfway’ point to begin searing the other raw side. After the second sear, it is ok to flip and adjust the steak around once more until desired internal temperature is reached. An average total of 3-4 minutes per side is required for thinner cuts, and about 6-8 minutes for thicker cuts. For any steak doneness, remove the cut from the grill approximately 5 degrees below desired internal temperature. A cut pulled at 130 F will reach a rare 135 F cooked internal temperature due to carry-over cooking. Final internal cooking temperatures listed: Medium rare 145 F, medium 155 F, well done 165 F.
Allow the meat to rest on a very warm plate for a minimum of 5 minutes or just about the same time it was cooked, slightly covered. Slice against the grain to aid tenderization. Sous-vide cooking is perhaps one of the most progressive cooking techniques to date. It entails packing and vacuum-sealing a protein into a bag and cooking it in a current-circulating hot water bath. It is a low temperature, in-direct dry-heat transfer from the water, through the plastic and oil (if any) directly to the protein. (Reminder: There is no external steam during sous-vide). Place the beef into a food-grade plastic bag with accompanying components such as oils, herbs, garlic, and seasoning. Vacuum-Seal the package and place into a water bath set at the same temperature desired for meat doneness. Each steak for a Rare finish averages at 130F. A ½ inch steak averages a time duration of about 1 hour. (2.5 Roast averages about 5 hours for a 135F finish). Searing a sous-vide cut develops complex flavors that easily adorns a sous-vide cut. Be sure to gauge what time you pull the steak as to not over cook it during the searing process. Covered. Slight carry-over occurs as well as distribution of juices. Slice on a bias to aid tenderization. Roasting is a versatile cooking technique involving a dry, consistent and direct-heat transfer to a liquid or dry surface. It is usually done in an oven. Tips with a bit of supervision is the trick to succeeding the Roasting technique. 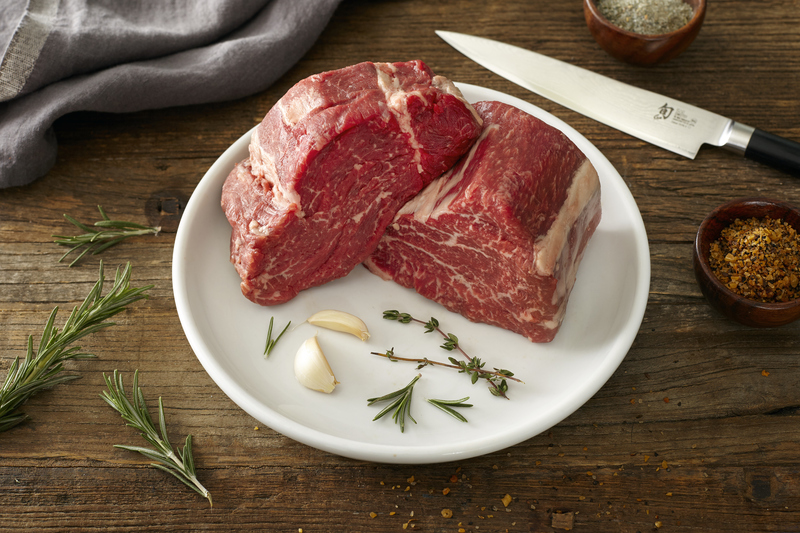 Roasting is great for large cuts of beef from the Chuck, Round, or even Brisket. Fattier, more marbled Roasts come from the front end which includes the brisket, chuck, and loin primals. Leaner roasts from the Round primal requires a more moist approach while roasting. Any inconsistent-in-shape cuts should be trussed (tied with butchers string) to allow for even cooking and support during carving. After the cut has come up to room temperature, brush it with oil and season liberally with salt or a rub. High heat develops flavor. Using the dutch oven pot, sear the cut to a deep golden-brown finish. (Refer to “How To Sear”). Reserve the cut. Saute some rough-chopped onions, leeks, and shallots for a few minutes and deglaze. Place the cut back on top of the vegetables (or on roasting rack to keep it out of the drippings) and place into the oven, uncovered for 45minutes to 1 and half hours (depending on the size). The high temperature will continue to darken the cut. Once a crust has formed on the Roast, add 4 cups of water (6 cups for leaner Roasts) to the dutch oven pot and cover it with a lid or tinfoil. Low heat preserves moisture. The juices and rendered fats rise will and cook the meat more gradually and gently, especially with a slightly steamed pot. Roast between 20-30 minutes per pound. Average roasting duration is approximately 2 hours. Supervise the process by checking the internal temperature with a thermometer at every pound-duration. Using tongs, flip the roast to even out heat distribution if needed. This is a gauge for when to add additional vegetables partway. A beef cooked to rare should have an internal temperature of 125-130F. Medium rare: 130-135F. Take the meat out 5 degrees before the desired doneness. Let it rest covered for at least 10 minutes. Carry-over cooking will occur and juices will be redistributed. Carve the meat against the grain to aid tenderization. Pan Searing is a technique to rapidly heat the surface of the meat to form a golden-brown caramelized crust. This crust is the key to great flavor, whether you are sauteeing, grilling, or roasting. The fundamentals of searing are simple. It is best to use a low-walled pan. A standard stainless steel, aluminum or cast iron sauté pan is ideal. It’s less effective to sear in a pot because cooking vapors remain trapped in the high-walled pot, creating a moister environment which disrupts and loosens the direct contact needed for a perfect sear. Use an oil with a high smoking point because meat needs to be cooked at fairly high temperatures, such as Avocado, Coconut, Grapeseed, Sesame, Safflower and Sunflower oils. Pure olive oil is also a fine choice, but Extra Virgin Olive Oil reaching high temperatures. Approximately an hour before cooking the steak, bring the refrigerated cut out to room temperature and pat it dry. For a perfect sear, there cannot be any surface moisture between the meat and hot oil-pan surface. If you’d like to salt the meat, make sure you let the salt sit on the surface for at least 45 minutes so that the brine is fully reabsorbed by the meat. Preheat a small amount of oil (just enough to thinly coat the surface of the pan) to a high temperature, but not until it smokes. If the meat is placed too soon, it will stick to the pan as the oil comes up to temperature. You can safely test this by touching the tip of the meat to the pan – if it sizzles, it’s ready. Be sure to place the meat into the pan near-end first, then away from yourself. This will reduce the chance of any oil splattering towards you. After placing the cut in the pan – leave it alone. This is a crucial step to searing. The surface, in direct and consistent contact with the hot pan, undergoes the Maillard Reaction and produces the golden-brown crust. If the meat is moved around too much after initial contact, excess moisture will build up under the meat and disrupt the sear. Using tongs, flip to sear the other side. Use tongs instead of a fork to prevent the risk of stabbing and losing juice from the meat. Once both sides have been seared, it is okay to flip it around to finish the cut to the desired internal temperature if needed. Remove the steak from the pan approximately 5 degrees below the final desired internal temperature. i.e. For a Rare, 135F cooked internal temperature, remove at 130F. Final internal cooking temperatures listed: Medium Rare 145F, Medium 155F, Well Done 165F. Allow the meat to rest on a very warm plate slightly covered for a minimum of 5 minutes, and roughly 5 minutes a pound for roasts. During this time the meat continues to cook From this, carry-over cooking finishes and juices are redistributed. Slice against the grain at an angle to aid tenderization. While pan searing, all the delicious little bits of meat and Maillard-residue sizzle away during and after an initial sear. This is the foundation of a great gravy or sauce. As a result of searing a significant amount of flavorful crust from the meat sticks to the pan (and it would be a shame to wash it away). “Deglazing” is the process of loosening those flavorful bits by adding some moisture to the pan. Splash some wine with a pat of butter into the pan to begin developing a sauce for your seared meat. All of the broken-down, complex compounds amount to a phenomenal foundation of flavor for any sauce, jus, or gravy. Braising is a moist-heat cooking technique that involves direct heat transfer. Sometimes known as Pot Roasting, braising involves cooking large, partially submerged cuts of meat in a liquid while allowing for dry heat to cook the upper-half. (Stewing is a similar cooking technique in that smaller, usually cubed pieces of meat are entirely submerged). Defrost the meat in the fridge overnight. Remove from fridge a minimum of 30 minutes before to allow the cut to come up to room temperature. This will allow for even cooking. High heat develops flavor. Using the braising pot, sear the cut to a deep golden-brown color. (Refer to “How To Sear.”). Set the cut aside on a plate. In the same pot, brown (but don’t scorch) any vegetables. Most popular is the Mirepoix (Mee-reh-pwah): carrots, onions, and celery. Deglaze the pot with a splash of wine to loosen the flavor bits. Return the meat back to the pot with the accumulated juices and herbs. Add enough broth so the meat is not entirely submerged. Water is fine for this, however, a protein-based broth enriches the braise and optimizes flavor. Bring the liquid to a simmer and place inside the oven, covered. (You can also braise on the stovetop if you prefer, in a covered and well-sealed deep pan.) Due to evaporation, add more liquid if needed. Braise for 5 hours for approximately 2-3 pounds of meat. Do not season the broth until after the sauce has reached desired thickness. About 45 minutes before the meat is fork tender*, add additional vegetables such as fennel, potatoes, parsnip, or leeks to expand flavors. After the meat has cooked through, carefully strain the stock. Skim the layer of fat off the top and reduce the sauce by simmer to a viscosity that coats the back of a spoon. Understanding the characteristics of each cut allows you to navigate and choose different cooking techniques. It’s also benefiting to know about which cooking technique applies best to which types of cuts. The approach on how to cook a steak begins with learning about the structure of a particular primal. What is its function and what is each specific derived-cut like? The logic behind cooking beef is like that of “If this, then that.” After some attempts (and with a more calibrated palette), you’ll find yourself piecing together different ideas on how to cook your meat like a puzzle. There are generally two different types of “heats” involved in the multiple cooking methods we may choose from to cook beef: Moist and Dry. Moist Heat cooking methods use water, liquid or steam to transfer heat to food. Examples include braising, stewing, pot roasting, and simmering. Dry Heat, on the other hand, involves the use of air or fat to cooking a protein. This includes grilling, roasting, sautéing, and broiling. Both methods produce rich flavors. Moist cooking methods extract deep flavors whereas dry cooking methods transforms flavor through the browning of foods. Furthermore, high heat develops flavor and low heat preserves moisture. Keeping this in mind, the experience of cooking beef is heightened as you may decide to apply different techniques with one another. it is important to appreciate the individual cut for what it is. Let’s take a look. Consider the shank for example. Being a part of a leg, it is easy to understand that this cut has always been highly active. The cow stands, rotates, walks –all while supporting its balance and weight. By nature a high-active cut results in having muscle grains being tough. All this means is that it simply requires a moist, low-temperature cooking method to break down the structure. Additionally, high-active cuts tend to be less marbleized with fat. On the contrary, less-prominent muscle strands in a low-activity cut such as the Rib Steak tend to be homogenized with fat. The cut is very delicate and tender. A dry, high-temperature cooking method is best because it uses the integrated fat as a catalyst to cook the protein rapidly without rendering too much of the flavor away. From the mouth-watering barbecues in Texas to the home-warming stews in Hungary, any delicious beef dish begins with the basics. The vast realm of cooking and experiencing beef ‘tastefully’ requires curiosity, dedication, and appetite! There’s no easier way to prepare great hamburgers every time than starting with premium patties and grilling straight from frozen. Grab the patties right out of your freezer. Cut open the pack and use a sturdy grilling spatula to carefully split them apart. Remove any paper separators. Season the burgers lightly with salt and pepper. Note: thawing for a couple of minutes may make splitting easier and will help the salt and pepper stick. It helps for it to be hot. Place the seasoned, frozen patties on the grill and flip every 3 to 5 minutes. Keep an eye on things as they sizzle and cook. If you encounter flare-ups, shout “oh mama! !” and move the burgers to a separate area and wait a minute for things to settle back down. Total cook time: 15 to 25 minutes. Right now you may be thinking, “I’ll skip this part, it’s not worth the hassle.” Yes it is. Also, please melt some butter in the microwave and brush that on. It’s worth it. Mayo, onion, lettuce, tomato, cheese, meat, pickles, mustard, ketchup, bacon? It’s up to you, but whatever you choose, just remember: you deserve it. Salt your steak liberally before cooking. Use your finger or a meat thermometer to test doneness. Let rest five minutes before serving. People have known for hundreds of years that the dry-aging process makes beef more tender and its flavors nuttier, mustier, and more complex. It’s rather like what happens when you let a wheel of cheese develop in a cave over time – the whole flavor profile can evolve and deepen as microbes do their magical work. A dry-aged steak can lose up to 30% of its initial moisture as water evaporates. This water loss concentrates the flavors and pays off in rich, buttery taste. But it’s important to know that to compensate for lower water content, a dry-aged steak requires a shorter cooking time. This is even truer for grass-fed steaks, which tend to be a bit leaner. So watch that grill or cast-iron pan when you’re cooking a dry-aged steak for the first time. Deliciousness awaits those who cook carefully! We’ve come to be big fans of not defrosting at all before cooking beef. Except for Wagyu, which has fat that is known to melt at room temperature, it’s certainly easier, and experts say it’s better to cook beef directly from its frozen state. Cook’s Illustrated senior editor Dan Souza did an experiment with 8 frozen New York Strip steaks, cooking half straight from frozen, and the other half after thawing. What he discovered was that the frozen steak 1) cooked more evenly, 2) lost less moisture, and 3) – most importantly – tasted better. For steaks, we often defrost for 2 or 3 minutes by putting the steaks (still in their vacuum-seal wrap) in a pot of lukewarm water just so the surface defrosts a bit and takes salting more easily. Conversely, if you’d like to thaw your steaks on the counter, it normally takes about 5 or 10 minutes for the surface soften up enough for seasoning. Heat up a skillet filled 1/8 inch deep with oil. Sear until browned on all sides (90 seconds per side). Transfer to wire rack set into a rimmed baking sheet. Cook in a 275-degree oven until desired doneness (18 to 20 minutes for a 1-inch-thick steak). Prep Allow your thick-cut steaks to defrost overnight. Remove from fridge and bring to room temperature an hour before you’re going to cook. If you are cooking in the oven, place steaks on a baking sheet or oven-safe pan. Preheat the oven to between 200-275 degrees. Place your steaks into the oven or on to the grill. Cook until the steak is 10-15 degrees below your desired temperature. Use a thermometer and check frequently! Before you take your steaks off the grill or out of the oven, heat a tablespoon of olive oil in a cast iron over high heat. Be sure to wait until the pan is hot - this is very important! The pan has to be really hot for a good sear and to trigger the Maillard reaction. Add the steaks to the pan and cook for 45 seconds on each side.